This post is just our own, independent, Tubby Gorilla review. 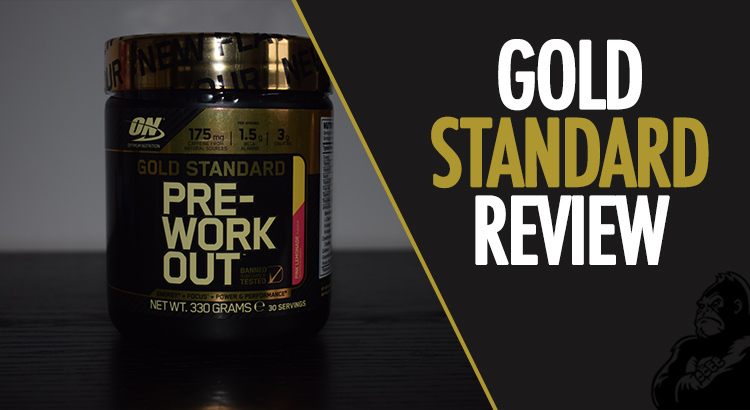 Three of us have tried and tested the Gold Standard pre workout and this review is what we think about it. Our other post takes into account what other users around the world have said from fitness social media groups, bodybuilding forums and other expert reviews. Before we start, I just want to clarify that we’re not being paid by Optimum Nutrition for this review. The reviews and feedback given are our honest and unbiased opinion about how it worked for us. Many reviews will build up to the overall effectiveness of the supplement, but we know that’s what you’re here to find out. I took the Gold Standard about 30 minutes before working out and I did feel a little more energetic after taking the pre-workout, nothing major, but I did have an energy boost. Whilst working out I became slightly more alert and focussed, I kind of thought to myself ‘here we go, the Gold Standard is working’. However, this boost only lasted about 20 minutes or so and then disappointingly wore off. I don’t know, the kick was there, it was good, I felt good and then it suddenly is wasn’t there any more. It vanished. Like I said, this was disappointing. Throughout my workout my endurance levels were probably the same as normal, nothing had changed in that aspect. The Gold Standard pre-workout didn’t have a negative impact. I have known pre-workouts to make you feel dizzy or so itchy that it’s distracting, but the Gold Standard was fine, it didn’t slow me down, but I guess it didn’t speed me up either. This could be because of the lower caffeine content in Gold Standard, which I know is a major positive for many people, especially those who like to workout later in the day. With this in mind, I would still recommend trying Gold Standard as you may have a more positive experience than me. “On the day that I used the ON Gold Standard, I went to the gym before lunchtime, which is unusual for me as I prefer to eat before going. My workout was still fine, with not much difference to a regular workout. I felt the pre-workout gave me the boost to get through, especially with the change in eating routine” – Luke, male reviewer, 5’11”, 165lbs. Another great benefit of this particular pre-work is the price. The Optimum Nutrition Gold Standard came in as the cheapest pre-workout on our list of the best pre-workouts for 2019. This is a huge benefit, especially if you’re a beginner looking to find a cheap pre workout to test out. Although my experience of the Gold Standard wasn’t great – compared to some of the others I’ve tried – it is a good entry-level or beginner pre-workout. Check the latest price of Gold Nutrition on Amazon here. At risk of repeating myself, there was an energy boost and I did focus in once the Gold Standard kicked in, but it just wore off really quickly. At risk of repeating myself, this could well be different for you and from other reviews we’ve seen online, many users found it to be an effective pre-workout that gave them energy, focus and endurance throughout their workout. But it just didn’t do it for me. One of our testers (a gym beginner) thought a lot more of the Gold Standard than the others. This backs up the suggestion that this is more of a beginner-friendly pre-workout. “I had a reasonably good workout with the ON Gold Standard. I was focussed and pushed hard on areas that I’ve never really worked out before. I’m not sure if the pre-workout helped with this, but it certainly didn’t hinder me” – Jordan, male reviewer, 5’9″, 155lbs. When I was typing up this review I thought to myself “I don’t remember it being this ineffective” and as you’ll see in the side effects section, one of our reviewers said they felt light-headed and nauseous in their workout after taking the Gold Standard. So I thought I’d try it again and I used it yesterday before a chest workout with some HIIT cardio to end. Towards the end of my workout I started to feel not quite right. I was sweating a lot more than usual, the pre-workout had left a bad taste in my mouth and I was focussing more on how I felt rather than my workout. When I got home I was actually quite sick (grim, I know, sorry). Afterwards I felt fine, back to normal, but for about 20-25 minutes I was pretty sure my time had come to an end. But I will say there are other circumstances in play here. This was my first day in the gym with a new, minimal-carb diet and this was the first time I had added HIIT to the workout. Less food, less calories, more work. I don’t think the ON Gold Standard solely made me sick, but there was a combination of things, the pre-workout included. I’m tempted to give it another try to see if it happens again. I’ll hang fire for a while though. Just in case. 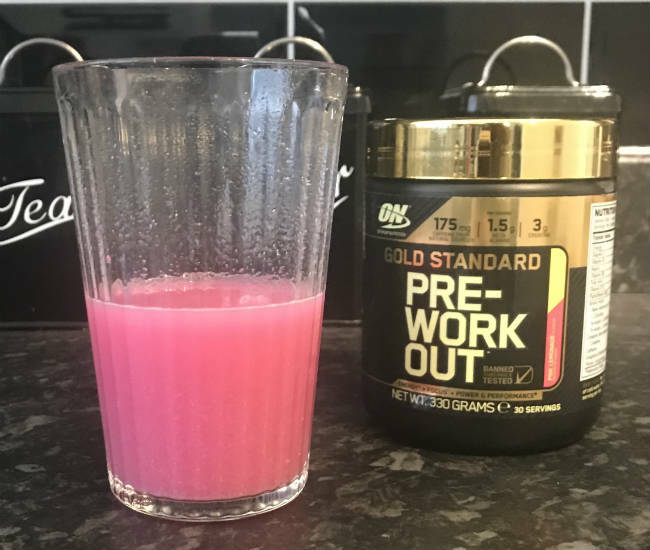 Pre-workouts aren’t they nicest tasting things at the best of times, but Gold Standard was definitely not gold when it came to the taste. It didn’t taste particularly nice, it reminded me of a sour sweet that was unbearable as a child. Although, taste isn’t what pre workouts are about so I gave it the benefit of the doubt. The bits that were smooth, were smooth (obviously) but did have some residue that just wouldn’t mix. As you can see in the picture above, there’s a lot of residue at the bottom of the cup. When you combine the taste and the lumpy consistency, it doesn’t make for good drinking. However I drank it, it wasn’t so bad that I was heaving or spitting it out, so that’s good enough for me. “This pre-workout just would not mix! There were still bits in it and it was lumpy at the bottom after aggressive mixing and putting it in a blender”​ – Luke, male reviewer, 5’11”, 165lbs. As mentioned I was sick following my workout after using the Gold Standard. Again, this is most likely a combination of new diet, new workout and the pre-workout probably just got caught up in the cross fire. However another reviewer also said they were sweating more than usual and felt light headed and nauseous. I don’t now why this would be, I’m not claiming that the ON Gold Standard makes you ill, but three of us tried it and two of us didn’t feel good during or after the workout. 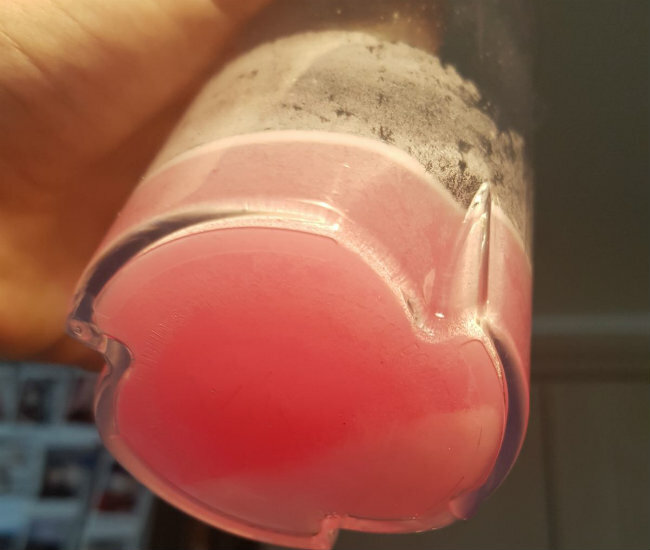 “I noticed that I was sweating a lot more than usual during my workout, I can only assume this was due to the pre workout. My hearing went a bit weird, it felt like I was listening whilst having my head underwater. I also felt slightly nauseous and light-headed around an hour after having the supplement” – Jasmin, female reviewer, 5’2″, 125lbs. I, personally, would say Gold Standard Preworkout is average, but I would recommend you try it as it other people can’t live without it. Each reviewer did feel an energy boost, some lasted longer than others but that could be due to other factors. We also all felt a little more focused than normal so this supplement is definitely worth having rather than working out with no pre-workouts. If you’re looking for a low caffeine pre-workout or you’re a beginner looking to try pre-workouts for the first time, we’d say the ON Gold Standard is worth giving a try but if you’re looking for something with a more intense kick, this probably isn’t the best one for you.